The Curse of Monkey Island was the third game in the Monkey Island series, and the last 2D adventure game by LucasArts. It was also the last game to use the SCUMM interpreter. The game was released on October 31, 1997 for Windows. 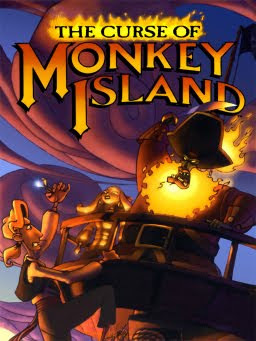 This game is the only Monkey Island game to not get a Macintosh release. However, The Curse of Monkey Island is playable on Macintosh with the fan made ScummVM SCUMM interpreter. The game was designed and led by Jonathan Ackley and Larry Ahern. The lead background artist was Bill Tiller, who would go on to found Autumn Moon Entertainment. The game is set after the events of the end of Monkey Island 2, and sees Guybrush in a bumper car, presumably having escaped from LeChuck's Carnival of the Damned. Guybrush reuinites with Elaine, and finally proposes to her. However, their celebration is short lived because the ring he put on her finger was cursed, causing her to turn into solid gold. To make matters worse, Elaine is kidnapped, leading Guybrush on a quest to rescue Elaine and find a way to restore her to normal. The Curse of Monkey Island is now supported by ScummVM, a program designed to let 2D adventure games run on multiple platforms. With ScummVM, The Curse of Monkey Island now runs on modern versions of windows, as well as Linux, Mac OS X, and many consoles such as Dreamcast, Wii, PlayStation 2, and PlayStation Portable. For a complete list of platforms supported by ScummVM, see here. The game is now out of print, however since it was sold at retail it is still available for purchase through the used games market.